The monkey ran into the cave farther than his previous best. He came across a flight of ten steps. He slowed down. There was no need to hurry. He had all the time in the world. He climbed each of the steps in awareness,slow and steady, reflecting over each one as to what they stood for. He felt as if he had ten heads, one for each level. He realised what it is to be a monkey. I am that and all the heads understood each other perfectly. The babble in his monkey brain ceased to be. He looked at the world outside. He could see all the abstractions in concrete. He said to himself. ” I am but a 10 % monkey ! Holy …..he rushed back to the cave. Went a little further searching for the next etching on the wall . He stood looking at the wall for a long long Now. What is it to be fully born? Raj was 15 and Herman, 35. They were walking home from the exhibition grounds, a very long walk to the Ashram where they stayed. Herman was a priest. The boy frequented the Ashram whenever he could. The boy was tired, falling into sleep and forcing himself to remain awake. They entered the gates and lied down on the grounds, both of them gazing at the star lit sky. Raj heard him asking “what is the meaning of all this”? The boy had no answers. Silence prevailed, something sparked in the boy’s mind. “Someday, I will know”. He never knew what was in store for the wish to come true. It was much later and getting himself burnt many times over that he knew that there is a price to knowing, the price that Oedipus had to pay for his insistence on knowing the truth at all costs. Herman did not last long in the Ashram. He broke his vows and walked out. Raj came to know of it much later. His efforts to locate him were not successful. Meanwhile many gods died very young for him. He had to pass through his personal omega point before he could come to a reasonable resolution of what he had hoped for on that starlit night, a journey of twenty six years. I had fallen into a reverie of our conversation the previous evening while Raj was preparing the ground for one of his workshops, talking to the group about the ‘The Thomas theorem’- “It is not important whether or not the interpretation is correct. If men define situations as real, they are real in their consequences”, a theory of sociology formulated in 1928 by two Thomases. He was going a step further proposing what he termed the Thomas Principle. are stuck in their respective positions; cannibalism and slavery are the outcome. The disciple has to fail the guru but Thomas never failed, the other adult in the ring of 13. The other Judas fell to greed and the rest failed to realize their adults much like the unhappy younger brother. When the prodigal son finds the adult, he returns to his father. In recovering the adult he had to let go of a father and the father recovers his very self. The church that Thomas went on to establish was built on the rock of reason unlike the other churches built on the rock of faith. Both work but whereas one thrives on dialogue, creates adults and community the other relies more on fear, manipulation and aggression, creating a setting that makes crusades feasible. Dialogue is possible only among adults, where reason prevails. Raj was stirring up a hornet’s nest. There was visible uneasiness among the group. I was thrilled to see that the group was approaching its omega point, which I define as the point of maximum sustainable confusion any group can withstand. The group will either break up or come to a reasonable resolution of the issues to form a community of practice for the rest of the programme. A few of them would form new alliances and bonds that would last a lifetime. I was here after two decades of our first meeting in one of my workshops. Raj appeared to be relishing the confusion. We want to create an environment of community here for the duration of the programme, he continued. Organizations are not for adults, community is. It is natural/imperative that the disciple fails the Guru – do a Judas- the mentee the mentor, student the coach, counselee the counselor. Peter fails repeatedly. Thomas, the rationalist, is perhaps the only adult in the dozen and his bible, the only adult version of the story of transformation. The church that followed him stood its ground in the cradle of all religions against successive waves of Buddhist, Jain and the Hindu revival. Disciples go on reinventing the master, do a Procrustus, and cut the cloth to suit their own different sizes. A stage will come in every learning relationship – including marriages – when the travelers reach the fork on the road. when master and disciple turn adults or one has to let go of the other on grounds of greater love, if that is the only way the other faces the reality of the dynamics. Resolutions might/not happen. When the prodigal daughter returns she finds that there is no father or daughter. In my father’s abode there are no husbands and wives, fathers or daughters/sons. The cheating wife is a product of this dynamics. She doesn’t want to cheat but has to cheat, destroy herself to rebuild herself. The other has to let her go even at the risk of her own death/suicide. Death is a normal risk to the human, but to die even before one is born is a greater calamity. Life will go on. The fifty year study of myocardial infraction is a recent example of the progressive decline in community among the Roseto. Probably we had better community prior to the beginning of settled agriculture among the hunter gatherer. So in one sense what we call progress was no progress but a decline and decay of community. Perhaps the universe is perfect, says the digital philosopher, Rudy Rucker. For the mystic the world is perfect beyond any uncertainty, he lives the connection with the whole and has repeated experiences of this connection which spills into his art, making it immortal. For him nothing happens by chance, everything is a participative outcome of the grand design. Tolkien believed mythology to be the divine echo of truth. We don’t allow them to die. For them to die, we need to draw the principles they embed and realise them in our daily lives. In those days art deserts the museum walls, the opera and the cinema halls and occupy the Wall Street, virtual walls waiting to be painted. Art is routine. If myth is the measure of wealth, India is the wealthiest of nations. Weighed down by the burden of myths they labour more, asking more questions on Quora than others in the world. The wealth of their myths lies hidden like the Temple Treasure of Trivandrum. Unearthing hidden treasures could be opening the Pandora’s Box as the state in Kerala has come to realise the proof of the Matthew effect, (Matthew effect – Robert K. Merton) – the poor in spirit becomes poorer in health and wealth. The indigo flight was on schedule. He was the last to board and was heading straight in my direction, with a beaming face. What a way to meet, twenty years and the very same date when we last met. I am Raj, he said, offering his hand. It is indeed a small world. I couldn’t believe my eyes. He almost looked boyish or at the most a 25 year old. Raj of my memory was in his fifties, one of those who had challenged everything one believed to be true. 1990. The workshop was coming to an end. Participants were visualizing their future. Raj, a onetime scientist with NASA stood up to share his personal vision of the future. Raj walked down the aisle to his seat. “The first step to walking with the gods is to be a true normal. What we consider normal is a false normal. “May be four dimensional, we are talking about the four fold path, the view that prevailed some 2500 years back in linear time. We need to see progress, decay and emergence across time, four aspects of the process that we call progress. Most often, progress has been mistaken for decay. Schopenhauer was 25 when he wrote “ On the Fourfold Root of the Principle of Sufficient Reason. One or four is not the issue. Seeing is the issue. Both saw”. “Do we have any remnants of the original affluent society”? “History is story, even science is. When facts are stranger than fiction, fiction sells no more. Story telling becomes story killing. His story is complete when read with her story. Hyper – text is layered and each reader has the option to branch off any time with his explorations on the pointers in different directions. We can now gainfully compress data as against loss-less compression of data. Philosophy is a product of affluence, rather an affliction of modernity. Mahaveera and the Buddha were princes who renounced material affluence to the spiritual. Spinoza worked hard to earn a living to philosophize. Our modern versions feed on the commons but talk in tongues alien to the commons in their journey to be crowned. They will in time be reduced to a wiki-page and when the number of hits falls below some prefixed number will vanish into digital oblivion. When space and time come together history gives in to the new, R, the net value between the two opposing flows. It might appear to be insignificant now but the tectonic plates have begun to shift and the process will gather force as we become free from being hooked to being connected. As virtual space expands we are less stuck with the material. I don’t have to move my physical mass to go to the bank or to buy and sell my shares or to be in real-time touch with my friend in the valley. Gravity is less of a constraint and achieving take off velocity demands less of an effort – in virtual space. We are stuck with the material – physical, positioned in the physical world. The perfect sheet of rubber transformed into a foot-ball has no rubber at its centre. “Give me a place to stand on, and I will move the Earth.” Archimedes saw the problem with our position. In nearly 2500 years we are still stuck with the problem. .
To move the earth, we need to re-position ourselves outside the earth, to a position external to the physical. We are much more than our physical selves. We see the true normal from this position, similar to the astronauts looking at the planet from space. True progress involves a return to the center. @ is the symbol of this return and the new journey. We understand reality through the tools we use. 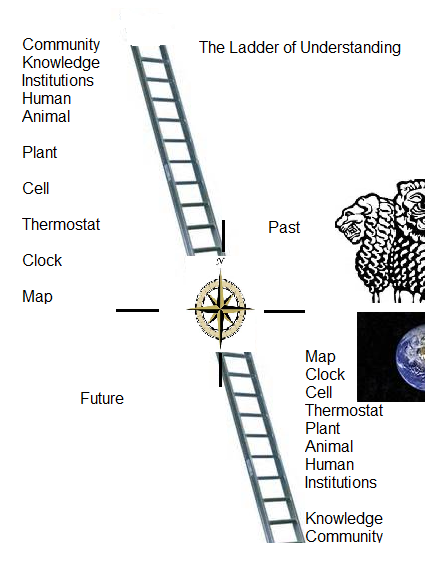 The compass is replaced by the GPS. We may not care how it works but we take it for granted that it shows us our position and whether we are on course or not. If we were to develop a GPS for the journey to our true normal- potential- the first step would be to fix our position as the GPS does in our journeys in space. What we see depends on where we stand, the position. 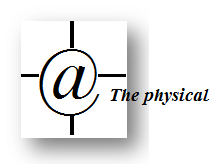 P’ is the position arrived at by the GPS and P is the position external to the physical realm. P shows us the true normal and P’ the perceived normal. P is in real-time, P’ in linear time. P is invariant and P’ is variant in time and space. The directions cover virtual and physical space. P’ has a time horizon of around 75 years, current life expectancy in Kerala and most developed countries, whereas P has eternity as the time scale. Since 1990 we have been confronting people with the question, what is to be human, in our work towards arriving at a common position in the contexts of teams and organizations. A Google search throws up not one but 29 answers in the first link that comes up on top of about 1,530,000,000 results (0.40 seconds). Simple questions are the most difficult to answer. None of the answers reduce our uncertainty. They only add to it. Does more information really help? Among those 29 answers, this one is central to this dialogue. 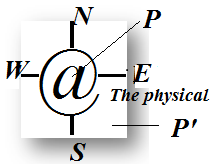 “The symbol-using (symbol-making, symbol-misusing) animal, inventor of the negative (or moralized by the negative), separated from his natural condition by instruments of his own making, goaded by the spirit of hierarchy (or moved by the sense of order), and rotten with perfection” – Kenneth Burke. He lived to be 96, for us a measure of his personal intelligence grid. Burke’s terministic screen’ is “a set of symbols that becomes a kind of screen or grid of intelligibility through which the world makes sense to us.” We named it ‘the matrix’ in our v.1 discussions. For Burke, reality is a clutter of symbols (1966). Things remain the same or even worse in the post-internet age. The clutter has only amplified. We hope you have looked up the wiki link. If we are separated from the natural by instruments of our own making, we could as well make instruments that bring us back to the natural too. “If 50 is the new 30 when do you turn into an adult? “Most metrics are quite arbitrary and we give undue weightage to numbers”. Most of us may never pass through the gate to adulthood if we define adulthood as maturity to self-regulate, take informed decisions that leads to continuous improvement. Adulthood in the information age is about discerning information from data, the competence to ask the right questions or search. Information is data that kill misinformation that takes us to more order than decay. Collectively we do not even manifest the wisdom of a single cell in its ability to take care of itself. We are yet to graduate from the level of the clock/ simple machines. Perhaps our institutions partially exhibit some of the characteristics of advanced machines with limited self-regulation. The cell is to the body as an individual is to the community. Let us look at the issue at this level before proceeding to higher levels of complexity. We are still struggling with improving this tentative proposition. The dialogue is on.